The Pioneer Cemetery is an attraction....of course it is as I wouldn't be mentioning it as such, but it is more for the history lover out there, or someone who is just passing by. You won't find many families setting off for trip to the place. 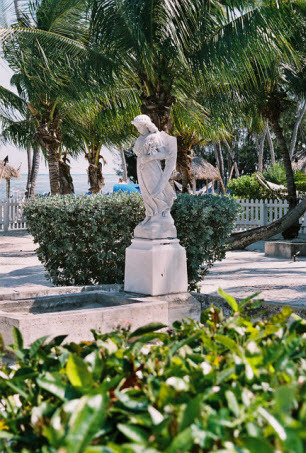 Found on the site of Cheeca Lodge down in Islamorada, this is a tiny collection of graves, statues and sand, surrounded by a small white picket fence. It doesn't look much at all, but when it comes to discovering the history of Islamorada, then the Pioneer Cemetery is very important indeed. You could say that without it, or at least without the folk who are laid to rest within its grounds, then the history of Islamorada would be very different indeed. What Makes The Pioneer Cemetery Worth Mentioning As Important? As you step into the cemetery and start walking among the graves you will see three groups of names appearing quite frequently: The Parkers, Pinders and Russells. These are the names of the first families to visit and settle on the Island of Islamorada, and so rightly are also known as the founding fathers and mothers of this lovely Florida Keys island. True pioneers, who traveled through unowned, unknown and undiscovered areas of America in true Pioneer style. See why they named the Pioneer Cemetery as such, and it is so special??? Actually special enough that in the late 1980’s the historical association of the Southern Florida designated the cemetery as a site of historical importance, and a plaque at the cemetery gate was placed into position to commemorate the event. Although the cemetery is all on its own, it wasn't always the case as once a schoolhouse and Methodist church once bordered the cemetery. However both were destroyed in the hurricane of 1935, which tore through the Florida Keys and caused so much devastation and loss of life, as memorialized by the nearby Hurricane Monument. One thing to look out for when you visit the cemetery is the angel marking the grave of Etta Dolores Pinder. The angel of course couldn't be left on the road, so was placed back in Pioneer Cemetery, but it's a nice little story to tell the kids if you visit. I've actually got my kids to walk all the way back to the highway to get them to understand the force of the hurricane and the amazing feat. So Can You Give Me A Summary Of History, And How Islamorada Was Founded? The first name to be mentioned is Richard Pinder, as without whom the history of the island would very different. Back in the 1850’s Pinder had been busy at work at a place called Green Turtle Key before heading across the waters to Key West. Green Turtle Key is in the amazingly beautiful Bahamas. So yep, with one step he went from the Bahamas to Key West.....talk about being spoilt. And for several years he stayed around that end of the Florida Keys pottering around, before he started to move up the islands towards what is now known as Islamorada where he was on the search for a homestead. Actually before coming to Islamorada in the 1850's he did make a quick detour and spent a little bit of time at Indian Key, where along with his two sons Adolphus and Cephas, he got stuck in and was one of the workers credited as building the Alligator Reef Lighthouse, but that is a different story. So looking for a place to rest his head and settle down, for the small price of $3.27, Richard Pinder paid for a small property that he had found on the beach in Islamorada. Nowadays $3.27 for a beachside property would seem a steal, but back then it was basically due to the law of the time an admin charge. You can't after all have something for nothing, even if it was back in December 1880. So Mr Pinder had finally set up home, paid his admin charge and throughout the 130 acres he now called home, spent time planting tomatoes, pineapples and limes. Of course there is so much more to it than this, with the Parkers and the Russells story waiting to be told too, so if you are interested in reading more make use of this great resource that will really add bones to the quick summary that I have laid down for you. Interestingly getting back to the plants and crops that Richard Pinder planted back in the day. He spent the time and effort growing these for his own consumption, but many of those plants and crops are still flourishing around Cheeca Lodge to this very day. Amazing to think that one man's natural efforts can remain as much as a tribute as the graves bearing their name in the Pioneer Cemetery. I think its a nice way to connect to the past. Is There Parking And A Fee To Visit The Pioneer Cemetery? Although it is found on the grounds of Cheecha Lodge, access to the Cemetery is not limited to guests only, so feel free to drive up to the lodge, park you car and then make your way around to the Pioneer Cemetery which is on the beach-side. How Do I Get To Cheeca Lodge? Cheecha Lodge is as you can imagine if you know anything about the Florida Keys is along the US1 highway in Islamorada. So just drive along until you see Mile Marker 82, which are the little signs at the side of the road, and you are there. And that is the beauty of the mile marker system in the keys. As long as you can count its hard to get lost.